Bauxite is the mineral form of aluminium. It is the most abundant mineral in the earth’s crust. 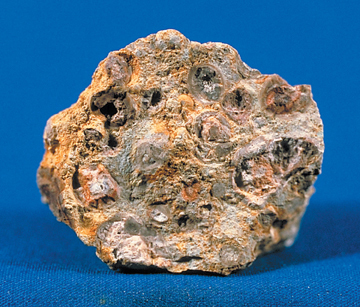 Bauxite contains about 50 per cent alumina. It is formed by the weathering of sedimentary rocks that contain a high proportion of aluminium bearing minerals. Bauxite is normally found in a layer averaging three to five metres deep, located about half a metre beneath the topsoil. Mined bauxite resembles small red pebbles, called pisolites, averaging about five millimetres in diameter. Aluminum compounds occur in all types of clay, but the ore that is most useful for producing pure aluminum is bauxite. Bauxite consists of 45-60% aluminum oxide, along with various impurities such as sand, iron, and other metals. Although some bauxite deposits are hard rock, most consist of relatively soft dirt that is easily dug from open-pit mines. Australia produces more than one-third of the world’s supply of bauxite. It takes about 4 lb (2 kg) of bauxite to produce 1 lb (0.5 kg) of aluminum metal. Caustic soda (sodium hydroxide) is used to dissolve the aluminum compounds found in the bauxite, separating them from the impurities. 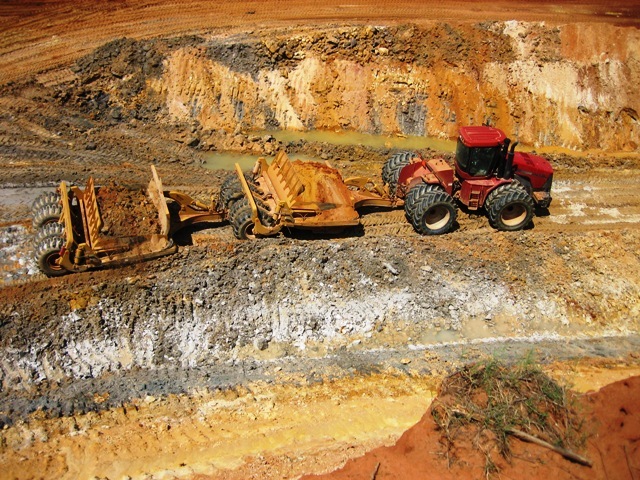 Depending on the composition of the bauxite ore, relatively small amounts of other chemicals may be used in the extraction. Alumina recovery begins by passing the bauxite through screens to sort it by size. It is then crushed to produce relatively uniformly sized material. 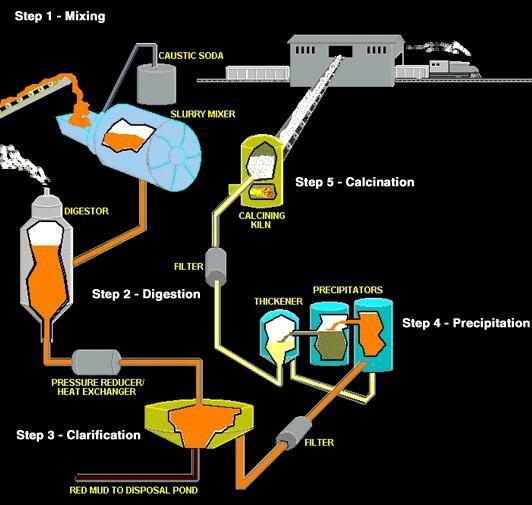 The ore is then fed into large grinding mills and mixed with a caustic soda solution (sodium hydroxide) at high temperature and pressure. The grinding mill rotates like a huge drum while steel rods - rolling around loose inside the mill - grind the ore to an even finer consistency. The process is a lot like a kitchen blender only much slower and much larger. The material finally discharged from the mill is called slurry. 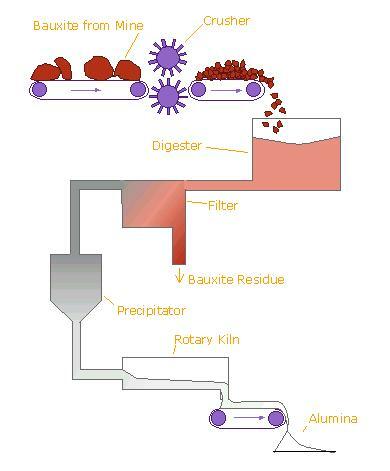 The slurry is pumped to a digester where the chemical reaction to dissolve the alumina takes place. In the digester the slurry - under 50 pounds per square inch pressure - is heated to 300 °Fahrenheit (145 °Celsius). It remains in the digester under those conditions from 30 minutes to several hours. Settling is achieved primarily by using gravity, although some chemicals are added to aid the process. Just as a glass of sugar water with fine sand suspended in it will separate out over time, the impurities in the slurry - things like sand and iron and other trace elements that do not dissolve - will eventually settle to the bottom. The liquor at the top of the tank (which looks like coffee) is now directed through a series of filters. After washing to recover alumina and caustic soda, the remaining red mud is pumped into large storage ponds where it is dried by evaporation.he alumina in the still warm liquor consists of tiny, suspended crystals. However there are still some very fine, solid impurities that must be removed. Just as coffee filters keep the grounds out of your cup, the filters here work the same way. The giant-sized filters consist of a series of “leaves” - big cloth filters over steel frames - and remove much of the remaining solids in the liquor. The material caught by the filters is known as a “filter cake” and is washed to remove alumina and caustic soda. 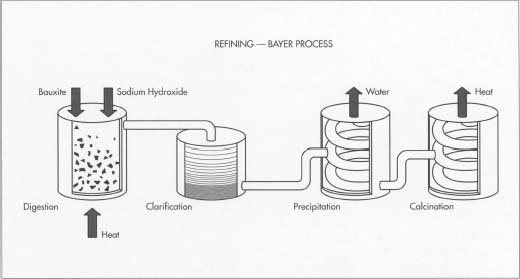 The filtered liquor - a sodium aluminate solution - is then cooled and pumped to the “precipitators.” The caustic soda and alumina solution passes into rows of thickener tanks where solid impurities sink to the bottom as a fine, red mud. 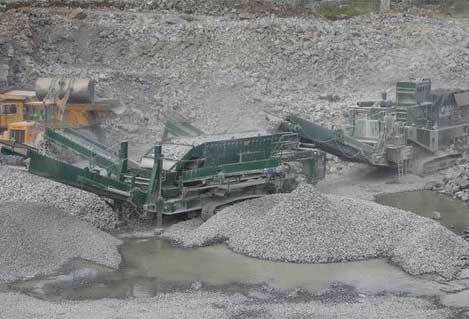 The impurities are washed several times with water and disposed of in tailings dams on site. The remaining solution of alumina trihydrate is filtered to make it even clearer. The alumina trihydrate solution is then cooled, concentrated and stirred in open top tanks until it forms into crystals. This part of the process can take several days. Pure alumina is added to this mixture to assist with the formation of alumina trihydrate crystals. The crystals are then washed, filtered and heated in gas-fired kilns at temperatures greater than 1,100°C to remove water molecules. The final product is a fine, dry, white powder, which is alumina. Alumina is then cooled and stored. From precipitation, the hydrate is filtered and washed to rinse away impurities and remove moisture. A continuous conveyor system delivers the hydrate into the calcining kiln. The calcining kiln is brick-lined inside and gas-fired to a temperature of 2,000 °F or 1,100 °C. The Hall-Heroult method of aluminium production occurs in large refractory-lined steel containers called pots that are connected in series and housed in long buildings called pot rooms. It slowly rotates (to make sure the alumina dries evenly) and is mounted on a tilted foundation which allows the alumina to move through it to cooling eqipment. The result is a white powder like that shown below: pure alumina. 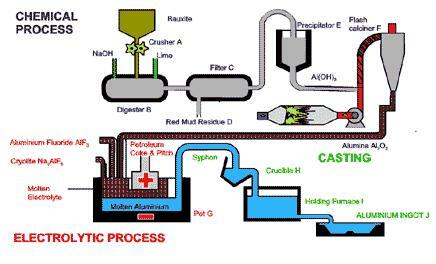 The caustic soda is returned to the beginning of the process and used again. 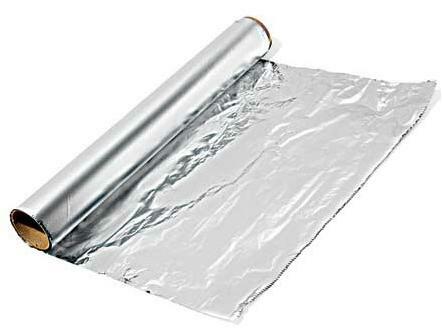 The aluminium, in molten form, sinks to the bottom of the reduction cell, while the carbon dioxide and other gaseous by products form at the top of the cell. The gases are cleaned to remove contaminants before being released into the atmosphere. 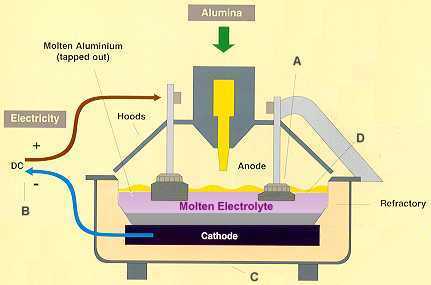 Molten aluminium is siphoned from the bottom of the cell by a process called tapping. 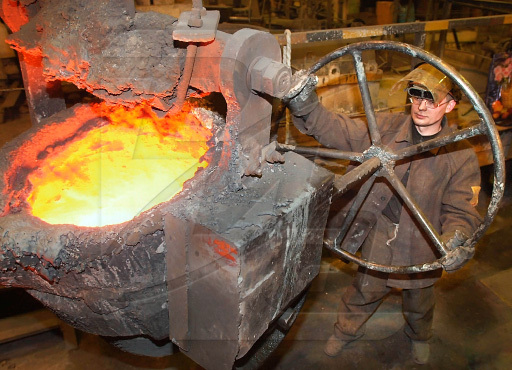 The aluminium is then transported to a holding furnace to be cast into products. Casting takes place in temperatures of just over 700°C. Aluminium is cast into ingots, large blocks, t-bars or long cylindrical logs called extrusion billets. Special ingot casting machines automatically cast, stack, strap and weigh the ingots into one tonne bundles ready for transport. Extrusion billets and t-bars are cast according to customer requirements using a process known as vertical drill chill casting. thank u so much…..thanks to support us..